I realized I never shared a shot of the Rosebriar living room after we staged it. We wanted to keep it really minimal so we can hopefully reuse the furniture in future remodels, but I still think it turned out great. The house is still listed, but there has been a lot of interest so hopefully the right family will find it soon! I love all the natural light flooding this area, it really is such a beautiful space. The house is still listed, but there has been a lot of interest so hopefully the right family will find it soon! The 911 E. Rosebriar house is officially listed here, so I wanted to get some of the exterior shots posted now that we have some with the sun out (these shots are courtesy of Murney). Also, I had to throw in a few before shots because - wow - it's changed SO much since December! The interior before & after shots are posted here. If you know anyone looking for the cutest house conveniently located in a cute and friendly neighborhood in Springfield, MO, please send them this way! And now how it looked back in December. Since the entryway, kitchen, living room and dining room all open up to each other now - and also happen to be some of my favorite spots in the Rosebriar remodel - I thought it made sense to include more of the detailed finished pics of these rooms all in one post. Click here to see the before and after pics of the entire house. Appliances and lighting all came from Lowes (their allen+roth lighting line is one of my total faves). Additional details, sources or color info available upon request! In December my dad (Home Crafters) purchased a home at 911 Rosebriar in Springfield, MO that needed some serious work. After just over 3 months, my dad and one other person completely transformed it from a neighborhood eyesore to a true gem. I was lucky enough to provide design assistance, so I got to pick the colors, finishes and final touches on much of the home while my dad made it all happen. I'm so blown away by how much they accomplished in such a short time. It's officially going on the market this week so I snuck over to get a few pics so I could show some good before and after comparisons. Unfortunately it was raining so I don't have exterior pics yet, but I'll create a new post with those. I've taken many more detailed pictures, so I'm thinking I'll break down a few of my favorite rooms in another post (namely the bathrooms and kitchen) and include source info. If you know anyone looking for an adorable completely remodeled, 2-car garage home in the Springfield area, send them our way! I'll link to the listing as soon as it's live. Since December my dad's crew, Missouri Home Crafters, has been remodeling a home in Springfield on Rosebriar street. It's incredible to see just how much they (mainly my dad) have transformed this home in 3 short months. I was lucky enough to provide interior and exterior design advice throughout. I'll post all the pics soon, but here's a teaser of the adorable front door. And here's where it started in December. 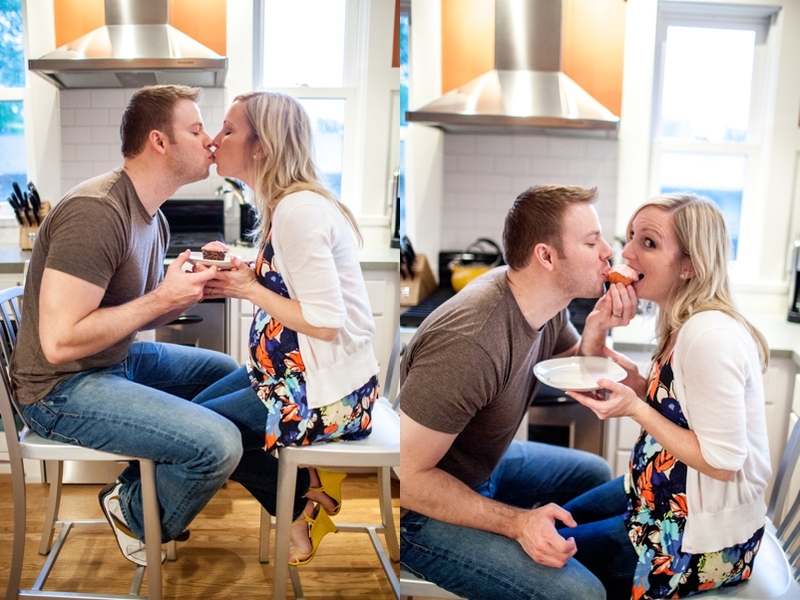 In December of 2013 I posted the 2 different ways we announced we were expecting to friends (see original post here). A few months ago I realized Sylvie had already grown into the onesie we'd bought to use for her announcement the year earlier, so I used that opportunity to play dress up and snap a few pics to create a then & now collage. The comparison collage turned out pretty cute. Superhero sister, you're sure sweet. For Carter's upcoming class friendship party (AKA Valentine party), he requested a Red Power Ranger Valentine box. Last year, while making his requested Superman box, I made the mistake of only making a torso with no head. While he loved it, it took him some time to get over the fact that mama wouldn't be adding a head! This year I wasn't making that same mistake. There really weren't a lot of examples on Pinterest, and I knew making a head would be tricky so I was a little nervous about coming up with a solution. One afternoon, as I watched the boys play with balloons (their favorite toy since both were babies) it dawned on me: a red balloon would be the PERFECT head solution! I grabbed a few supplies from Target, though fortunately it didn't really take much. I lucked out to find a red box in the gift aisle, so I didn't even need to wrap a box with red wrapping paper. I also bought a big bag of red balloons, a white vinyl table cloth, gold tape, and more construction paper. I already had the x-acto knife, black & silver markers, glue, scissors, and empty toilet paper rolls. The finished box along with our Red Power Ranger inspiration pic. In the end it took less than 2 hours to make and my son LOVED it! Sure, it's possible the head could get popped... but that's why I bought a big bag of balloons. So here's to a Happy Valentine's Day. Earlier this month I had the privilege of throwing a baby shower for Andrea, one of my dearest friends who is expecting her second babe, and first little girl, in February. I designed the invite in Adobe Illustrator and then uploaded it into Celebrations.com to send the evite. I spent a lot of time researching the many evite options and ended up really liking this website. I especially liked that it let me design my own template and matching event website, send invitations super quickly, and view and track RSVPs. It also automatically sent attendees reminder emails as well as recap emails to me. To make the dessert table banner, I found a blank brown chipboard banner at Hobby Lobby, then printed "Sweet Caroline" on white card stock and cut around the letters. The best part of this project was adding the red glitter at the end! I also adapted the evite design to make a little League of Their Own print - with a twist: "There's No Crying in Baseball. Well maybe sometimes." One of the other shower hostesses took care of the food and she did AMAZING! 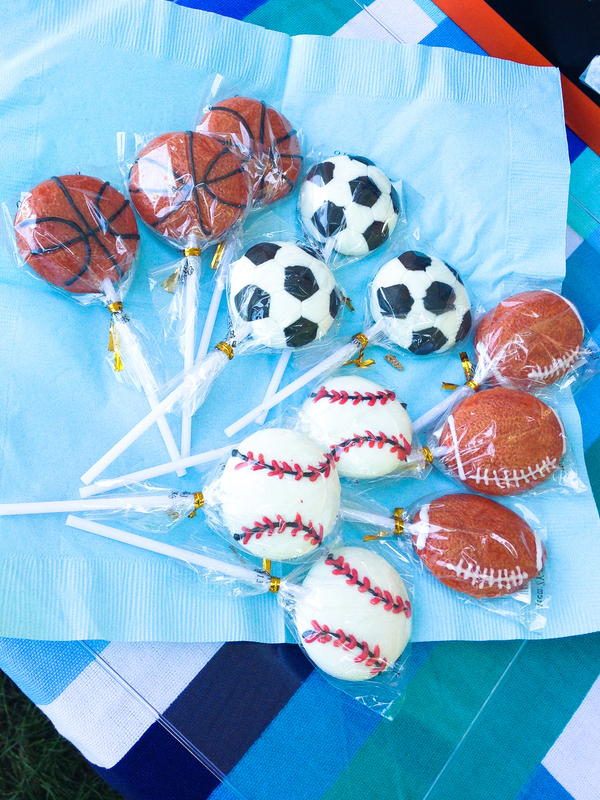 The baseball cake and cookies came from a local grocery store (Harter House), and they were so yummy. She made the tiny oreo truffles, and they were crazy good (thinking I need to follow up and get that recipe!). In addition to the many desserts, we had an entire table of quiches, crepes, numerous homemade breads AND a greek yogurt bar with fresh fruit. The spread was incredible! I was in charge of the punch, which I immediately got overwhelmed with when searching Pinterest. There were so many great looking recipes, but they all took a lot of time and ingredients. I needed it to be red, quick and good. I ended up settling on one that was super simple, and was so good my husband kept sneaking in and stealing some. Ingredients: 1 gallon of Hawaiian punch, two 2-liters of 7-up and then a bunch of scoops of raspberry sorbet. Super easy but also seriously yum. It tasted even fancier out of the gold glitter champagne flutes I found at Target! I made the fabric scrap banner through a tutorial I found on Pinterest (should've bookmarked it but forgot to). It was SUPER easy to make and only cost about $10 in supplies. Glitter cutlery and plates were not only super cute, they were also very thick and durable. Those, along with the baseball napkins, were from Amazon. For the centerpiece of the dining room table, which I forgot to snap a good picture of, I bought this baseball minky blanket from Mud Pie and laid it in the center of the table. Then I topped it with one of my husband's old ball gloves and a baseball. Since the table was packed with food and punch anyway, it was a simple - but super cute - space saving addition. Best of all: the guest of honor was happy and got a bunch of cute girly gifts. I'd say that means the shower was a success! 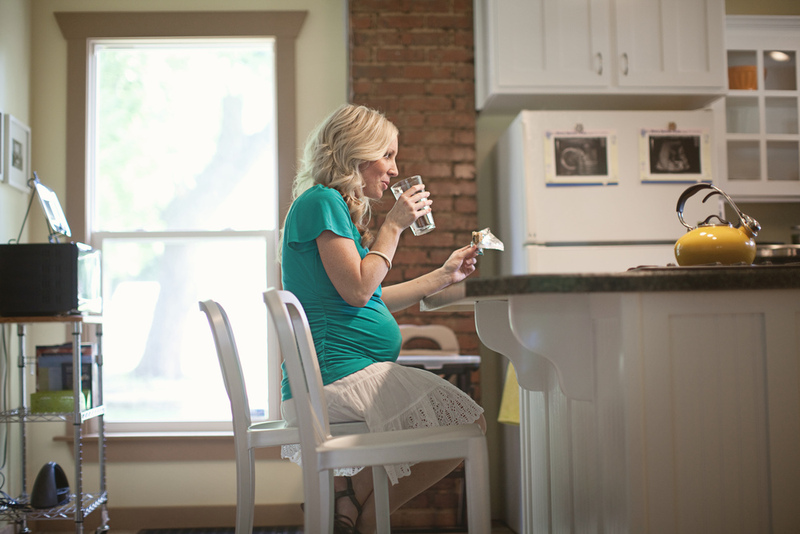 Last week while visiting with a soon to be mama, my overwhelmed friend asked me about my baby must-have suggestions. Now that Sylvia's reached 1/2 a year old, there are a few things I've been able to use quite a bit in the first 6 months with all 3 kiddos. 1. Awesome Blankets. Note the word "awesome" - not the tiny kind that only work for the first few weeks, but there are numerous types of blankets we've gotten a TON of use out of. For starters, Aden + Anais brand blankets are the perfect swaddle size. They're also super light weight, so you don't have to worry about your baby getting too warm. Both of the boys loved these blankets, and now Sylvie literally can't fall asleep unless she's holding one. We went with the all white set 4+ years ago and they still look like new (thank you bleach). Aden + Anais blankets were a total fave. You can also never have too many nice, soft large blankets or throws to lay out on the ground for your baby to roll around on. The whole fam can use these to cuddle up with in the winter time, you can toss one in the trunk for emergencies, use one as a nursing cover, or roll one out in the summertime for a picnic. I really want one like this from Pottery Barn! Lastly, knit blankets are the best! My cousin's mother-in-law knit blankets for all 3 kiddos, and so far both boys still sleep with theirs. Carter's is so worn, it's now nearly disintegrated. I really love if they're a looser knit so they're more breathable, which the boys love too. 2. Baby Carrier or Wrap: I. Hate. Carseats. I love that they protect my children in the car, but otherwise I hate them. If you've ever carried your child in a carseat, you know it weighs something like 2,000 pounds. Even better, there's no graceful way to lug that 2,000 pounds from A to B. While it's nice to be able to carry Sylvie in the house if she's fallen asleep on the car ride home, there's really no other reason I take the carseat out (except to clean under it). Have you ever tried to grocery shop with a GIANT carseat in your cart? You can buy exactly 4 groceries. All that to say, an awesome carrier is so convenient for those first 6 months when your baby sleeps a lot and can't really sit on her own. As soon as you have more than 1 kiddo, I'd say a carrier is pretty much a must as well. I've used an array of carriers for different reasons, but my fave/easiest to put on is a structured carrier like the Ergo, Boba or Bjorn. These 3 tend to be a bit more bulky and my babies rarely slept while in them, but they always kept them content and gave me free hands. The best carrier for the earliest months, and least bulky, has been a wrap. I really like the Solly Baby Wrap (as did Sylvie), but it's also the only wrap I've used. It's important to learn how to wrap it, which I know some find cumbersome, but for the cheaper price and extra cuddle time, I thought it was worth it. I typically tied the wrap on before I left the house, which saved a lot of time and kept it clean longer. 3. Toys You Can Attach: Each of my babies preferred different toys depending on the day, but the biggest thing I'd suggest is getting lots of toys that hook to things (like the Winkel), as well as lots of extra links. Sylvie loves to chew on the links, and I can also use them to hook toys to her carseat, high chair, and even crib. Seriously, so cheap and it saves you from fetching toys off the ground at a restaurant over and over. And over. 4. 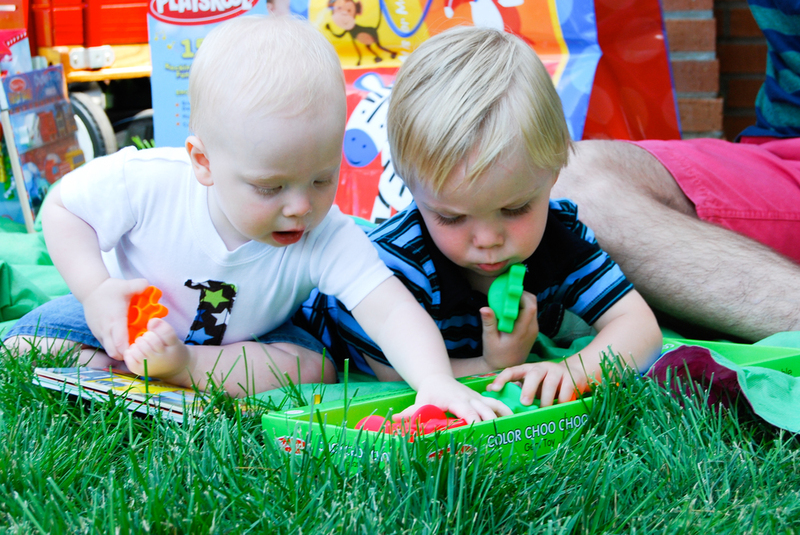 Clothes: It's no secret that I love dressing my kiddos (how fun are little people clothes?! ), but regardless of their gender, I can tell you there are a few practical items I've used over and over for all of my kiddos. Basic onesies. We love Carter's brand bodysuits, they fit my babies perfectly and held up well. In the summer they're perfect on their own, and in the winter they're a great bottom layer to keep your baby cozy. If they're neutral, they'll literally last for 3 children (or more)! I also really like Carter's leggings (much more practical for diaper changes & wiggly babies than jeans). Zipper sleepers. While we always have an array of sleepers (button up, zip up, 2 piece, nightgowns), in the end the zip up sleepers are just the best! Not only are they easier to get on and off (especially in the case of a blow out), they keep your baby cozy on the chilly nights. While they tend to run a little small, the Children's Place makes some of my favorites. Also, my husband can attest to the fact that I never get the buttons aligned on the first try. Seriously, it's a problem. Zippers all the way! Sylvie fast asleep in her FP Mocs. Shoes. All of my babies were born in the summer, so fortunately we didn't really need shoes until they were about 3 months old. While there's definitely no shortage of cute styles, I had the hardest time finding cute shoes that also stayed on their feet! It wasn't until the last few years that I discovered Freshly Picked moccasins. Game changer. There are tons of other moccasin companies out there, but so far the only ones I've tried are FP. Basically if you can find cute shoes (like FP or Bobux) with either a good elastic closure (something that works for both chubby and skinny feet) or strong velcro (I've had good luck with Livie & Luca brand), I'd say they're worth the extra money. When dealing with all the other things a newborn to 6 month old baby needs, few things are more annoying then worrying about losing a friggin shoe! 5. Convenience: Before kids we'd make a run to Sams every so often to stock up on the necessities (paper towels, tp, toothpaste, detergents - you know, the glamorous stuff). 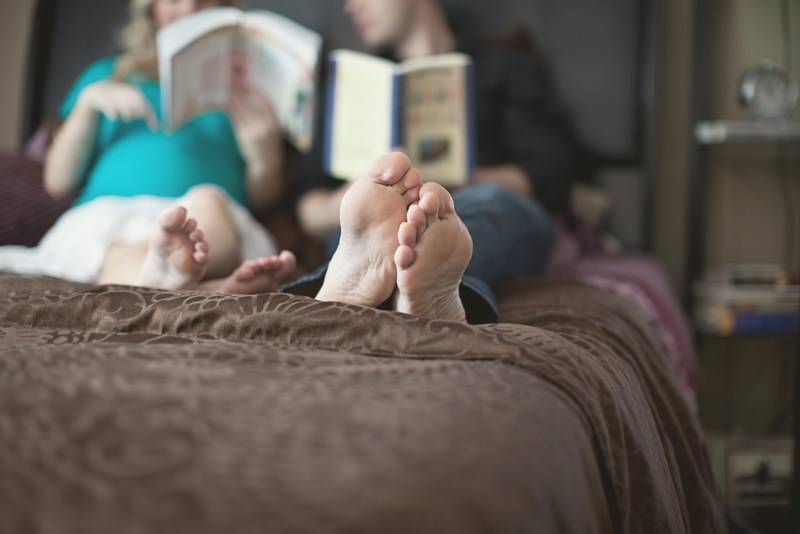 After kiddos, that errand became such a hassle, so we started looking for a better solution. Now we use Amazon's Subscribe & Save for allllll that stuff. As an Amazon Mom I get 20% off diapers, and free shipping on everything else too. So basically once a month we get a huge delivery of all the goods we used to go to the store for, and most of them are significantly cheaper. Such a win. Once Sylvia hits a year old, which I know will come too soon, I'll attempt to list more of my faves. Or maybe I'll be too busy chasing all these crazy kiddos! Over the last few months I've had the pleasure of virtually designing several rooms for friends, an interior design trend known as eDesign. As a graphic designer who has always had an eye for interiors, eDesign is a perfect fit for me since it combines all the things I love. Also, it's great that I can work on projects for anyone across the country, any time of the day. I love that eDesign is an affordable interior design option that works especially for busy young families who need flexibility. In meeting with clients over the last few months, it's become obvious that most people have good ideas for what they want for a room (or multiple rooms), they just lack the time and energy to put it all together in one place. In addition to the eDesign above, I include a Resources List with product info and pricing, as well as hyperlinks to each item included in the room - this makes purchasing super easy. I'm excited to see where this trend goes in the coming year(s)! After working on Sylvia's nursery on and off for the last 2 months, I can comfortably say it's complete! I'll always make little tweaks, but overall the hard stuff is done. The best part: I did it all MYSELF (prego and all)! I'm so happy to share Sylvia's bright & cheery room. It turned out just how I'd envisioned! I tried to incorporate a lot of old with new in her room. For example, the little pink & white flowery dress hanging on the wall was what I wore home from the hospital many years ago. The blue & white flowery quilt hanging on the crib was made by my aunt Ann, the pink blanket in the baby rocking chair was made by my cousin's MIL (she's made blankets for all 3 of my babies and they adore them). I made the Sylvia banner hanging above the changing table from an alphabet banner I found at Hobby Lobby (good thing none of the letters in her name repeat! ), and then used colorful tassels to add more dimension to it on the wall. As a comparison, here's a before shot of the room taken the very first time we walked through our home in May of 2011. When we moved in nearly 3 years ago, it was a dark green color and decorated for a high school boy. Ew. Sylvia's room before we owned our home. While we left the room green for Wesley, I was never a big fan of it. 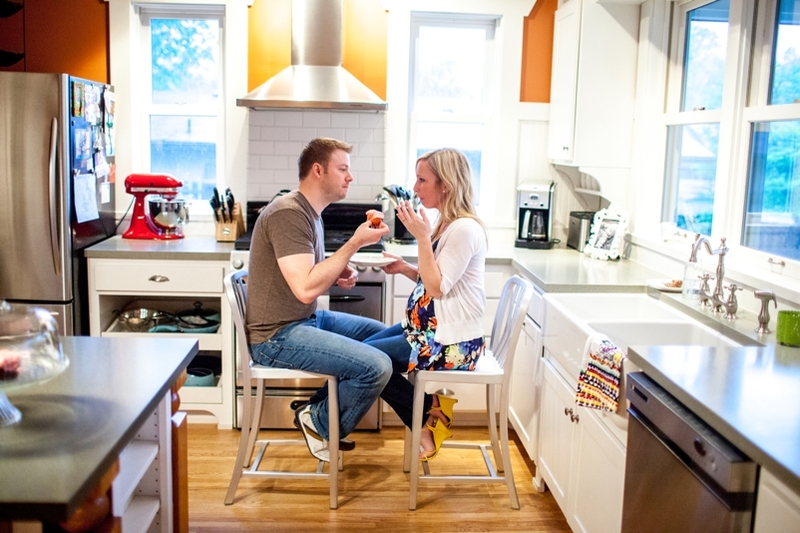 We were just too busy with work, babies, and the many other home projects that took precedent when first moving in! Here's a pano shot of how it looked in early 2012. Sylvie's room when it was Carter's nursery. We moved the boys in together earlier this year and they seriously love it. The tour of that room is here. My next task? Waiting for little sister, who could arrive any day now! We've taken maternity pictures when I was 31 weeks along with all 3 pregnancies, so it's fun to have an exact comparison between each one. In early April we had our friend Janae Hardy from The Itsy Bitsy House take our family/maternity session and I could NOT be more pleased with how they turned out. I love having sessions at or around our home because they always feel more personal and the boys seem to stay more comfortable. I especially love that she was able to snap a few pics in the nursery, even though it wasn't quite done (close enough). The light in that room is incredible. 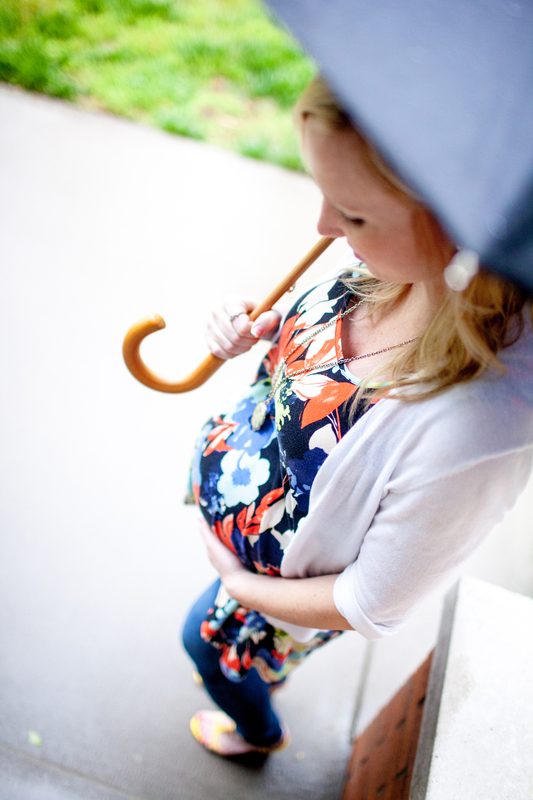 Here are a few of my faves from when I was pregnant with Carter in 2010 (taken by Itsy Bitsy House). My how our family has changed! Picking a first birthday party theme is tricky since the babes are still so little they really don't have many opinions yet. From just a few months old Wesley loved playing ball, so that made me want to do something sporty, but I wanted something a little more original too. Brainstorming sports memorabilia led me to the foam finger number 1, which felt like a perfect fit for Wes. 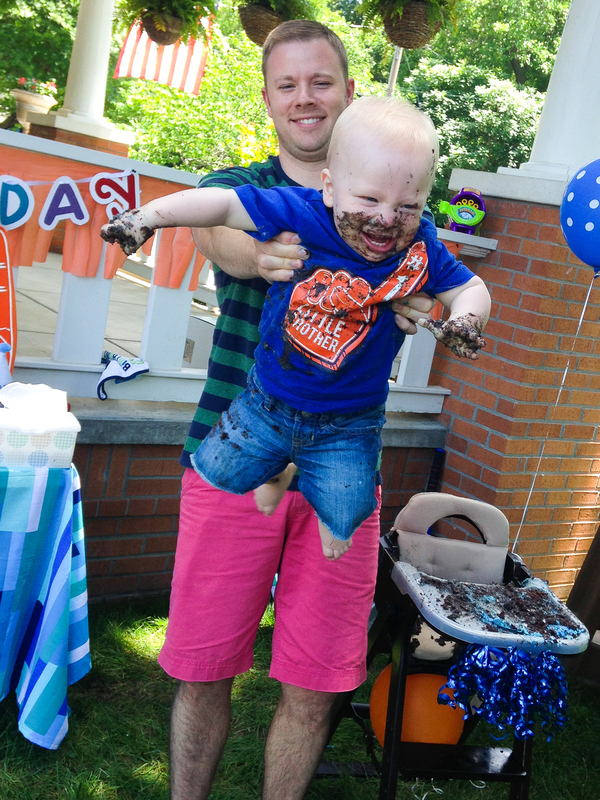 I was surprised more people hadn't already done this as a first birthday party. Or maybe they just hadn't posted about it online. 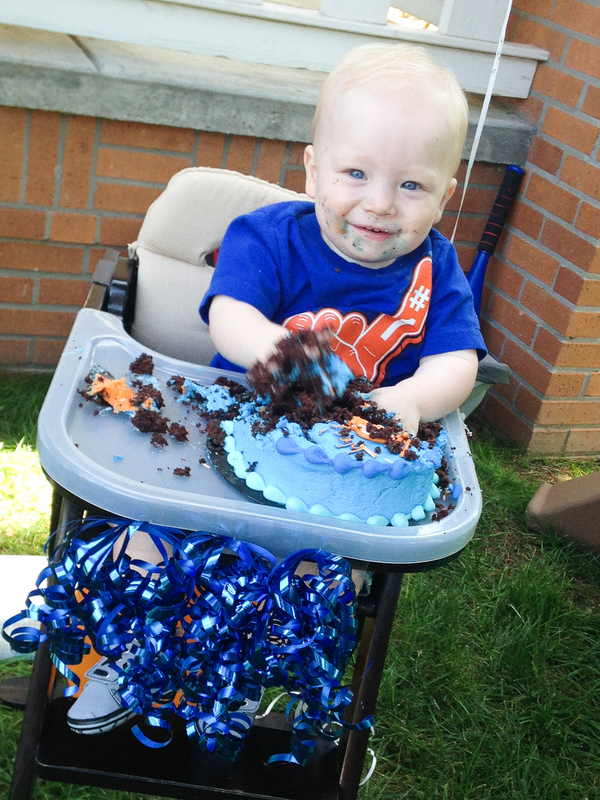 Either way, the party turned out great and, most importantly, Wesley had a great time. Here are just a few pics from the super fun day. few details: I designed Wesley's invitations and then took them to a local bakery to have them duplicate it (along with Wesley's special smash cake). It turned out great and tasted even better! 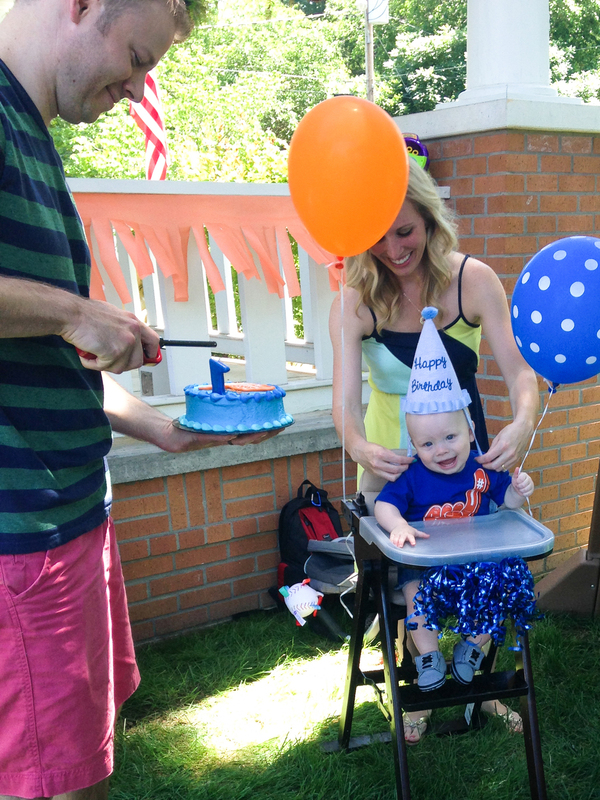 I filled a photo album with pictures of Wesley's first year and it was a hit with our guests. I did a similar thing for Carter and he loves looking through his album, so I know Wesley will too when he's a little older. I filled the treat bags with mini foam fingers & squishy balls (both from Amazon) and baseball peanuts. Then used some little stickers I'd had made when I printed the invitations for the labels. Overall they were super cheap and easy to throw together. 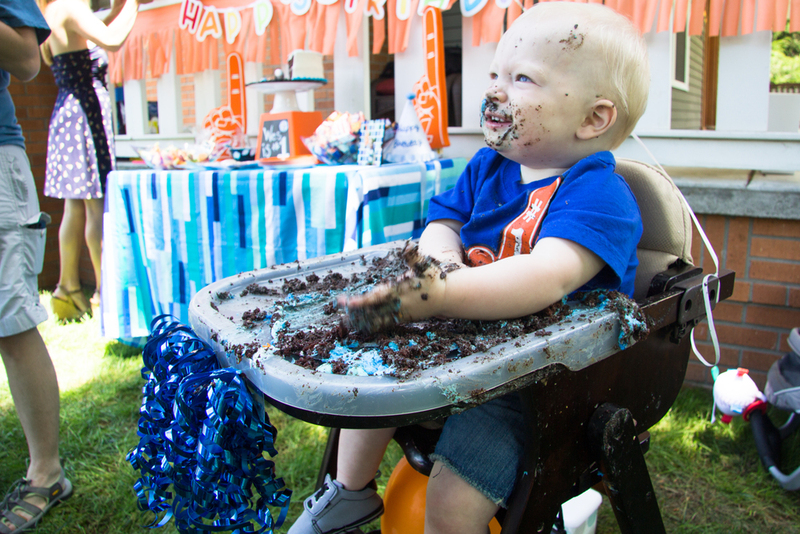 In the end the party was a success and Wes was a giant mess of happy-sugar-high baby. Just the way they're supposed to be following a 1st birthday. I've always enjoyed studying logos. As newlyweds one of Chris and I's favorite date spots was a local bookstore where we'd sip coffee and flip through piles of books and magazines. Chris always picked up what I classified as "nerd" books (typically about programming and computer science) and I'd pour over the design and photography books... and of course the occasional fashion magazine. I especially loved looking at the LogoLounge annuals filled with graphics from top designers. While I've never been featured in one of their books (nor have I ever submitted anything to them), someday I'd love to crack open one of their books to show my work to my kiddos. In the spirit of logos, these are a few of my faves I've created recently. I'm looking forward to creating more logos soon, and maybe even submitting to LogoLounge. I was excited to see Carter's preschool class was having an official Valentine party, I have so many fun memories of making Valentines & Valentine boxes with my dad. I wasn't surprised when I asked Carter what kind of box he wanted that his eyes lit up and he proclaimed "Superman"! I used a box from Target's party supply aisle, wrapping paper, construction paper, and tissue paper for the cape. Now we just need to add his name to the belt and we're set! The best part? Carter (aka Superman) LOVES it! I'd call his first Valentine box a success.